The band has just finished recording its new offering, due out in September, and told NME about the spooky goings on. 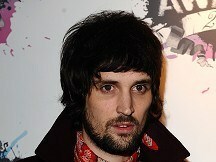 Serge said: "It was a really bizarre time. It was like spirits had taken over our bodies and we weren't really there." He went on: "I felt like that, because I'd just had a baby. So from six at night, a spirit would come down, take my body over Poltergeist-style, do the tunes then go. "Then in the morning I'd wake up, go back to the recordings, press play and go, 'F***ing hell, what's that? That's unbelievable."